Yorktown senior Hunter Embury goes behind the back for one of four goals in Huskers’ 10-5 win over visiting St. Anthony’s. YORKTOWN caused quite a stir last Tuesday when the Huskers erased a 2-0 deficit to post a comfortable 10-5 win over visiting St. Anthony’s, a longtime CHSAA rival and one of the best programs in the country, and Coach Sean Carney’s nationally-ranked (No.11) Huskers were nearly as impressive in Saturday’s 13-11 loss to No.18 Darien, winners of 55-straight games. Tied at 6-all early in the third, the Blue Wave reeled off six unanswered goals before the Huskers rallied behind the Marist-bound Embury brothers, who have led the charge for the Huskers all season. Hunter Embury bagged five goals for the Huskers (3-1) while Jamison Embury went four goals and four assists. Remarkably, the duo have combined for a ridiculous 52 points in four games (Hunter 18G, 5A; Jamo’ 12G, 17A), a pace that would push them to the limits of a combined 120 goals and 88 assists, pre-playoffs. Yorktown senior All-American D Brett Makar added one goal and two assists against Darien. The Maryland-bound pole is showing significant two-way ability. 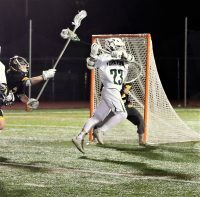 Against St. A’s, Yorktown senior Hunter Embury had four goals and one assist while twin Jamison Embury added two goals and three assists for the Huskers. Tim O’Callaghan added two goals while Alex DeBenedictis and Shane Dahlke scored once for the Huskers. Yorktown G Dan O’Meara made his second-straight start as Coach Sean Carney tinkers with his goaltending situation early on. Yorktown also posted a 19-6 win over Fox Lane. If CARMEL is ever going to take that next step, wins like last Tuesday’s 8-7 triumph over host PUTNAM VALLEY are imperative. Ram Matt LaFontaine scored the unassisted game-winning goal with 5:04 to play, and teammates Jaden Pellino and Ryan Taormina each bagged a pair of goals. Playmaker Henry Flocco (9 GBs) wound up with a goal and four assists to lead all Rams, who are on the brink of beating programs they’ve not beaten before. Put Valley sophomore A Kyle Wassil had a game-high four goals and an assist to lead the Tigers. Joey Macquignon (2G, 2A) added four points for the Tigers, who have to be concerned about losing to Carmel for the second year in a row. Pellino also bagged a hat trick, leading the Rams (3-0) to a 9-2 win over North Salem Thursday. The Tigers (1-1), meanwhile, bounced back behind a late rally, staving off upset-minded Ossining, 10-9, last Thursday. The Pride squandered a seven-goal lead when Mike Nolan scored equalizer with 8:40 left and Wassil scored winner from Macquignon with 3:40 left, so it’s safe to say something has motivated Wassil, a talented, powerful player with a nose for the net. The Pride were led by mighty Will Engelbracht (4G, 4A). In HEN HUD’s 12-11 win over Fox Lane A.J. Penella and Connor Gallagher each scored four times for the Sailors, who also got a goal and three assists from Bryce Caffrey and two goals from Max Popolizo. The win helped erase the sting of a 14-8 opening day setback to Scarsdale, in which Austin Fraser (3G), Connor Gallagher (2G, 1A) and Max Popolizio (2G, 1A) had multiple points. Reigning Class A champion LAKELAND/PANAS opened on a high note, posting an 8-5 win over Suffern and getting a double-digit effort from Steve Magarelli (3G), Joe Janavey (1G, 1A), Matt Hodges (2A) and Alex Davoli (1G, 1A). In MAHOPAC’s 9-1 win over New Rochelle, senior Ryan Dugan (3G), sophomore Tommy Elliott (2G), senior Jack Sarfaty (1G), senior Joe Dalo (1G), senior Mark Carey (1G, 1A), sophomore Zack Esteves (1G), senior James O’Brien (4A) all contributed to the offense while junior G Mike Argila stopped seven shots. With Put Valley, Greeley, Fox Lane and Byram Hills up next, Mahopac best go 3-1 or this could be a tough year with Mamo’, Scarsdale, Yorktown and L/P after that. No.1 YORKTOWN – John Jay can think what it wants but if Yorktown sticks together and plays its game, the Huskers will hoist their 41st Section 1 plaque, but the regular season game of the year between the Huskers and Indians is still on tap this Friday (7 pm). No.2 LAKELAND/PANAS – If Molloy-bound Magarelli can step up and fill the scoring void left by the graduation of Sean Makar, the Rebels (1-0) will be on to something in Class A. Huge stretch ahead, not a slouch among them. No.3 HEN HUD – Sailors (1-1) can fill the nets with 20 goals in two games but that defense best shore up in front of Mr. Bell before Stepinac comes to town today. Need to see consistency this season. No.4 SOMERS – Tuskers (1-0) defeated Guilderland 8-7 in double OT when Cameron Pepe finished with GWG from Brandon LaSpina, the foremost ice hockey player in school. We may have undersold Somers in our pre-season poll, but so long as Vincent Cartelli can score four goals and assist on another, while LaSpina (1G), Conor Jakus (1G) and Kevin Olifers (1G) can provide support, the Tuskers are better off than we suspected. G Tyler Carr (14 saves, 1A), we know, will stand tall most nights. Big tests against Rye and upstart Carmel this week, best not sleep on either. No.5 MAHOPAC – ‘Pac zone defense looked pretty tight for about 20 minutes before P’ville opened the floodgates in 10-1 Indian setback. I can’t remember a year when Pleasantville was this impressive in football and lax; Panthers could win an unprecedented two state titles if lax follows suit. No.5A CARMEL – Rams (3-0) knocked Put Valley off the list and I’ll be dying to see if they can run with their crosstown rivals by the time May 16th rolls up. If they can somehow knock off Somers on April 5th, we’ll be a bigger believer in these upstart Rams.